In the aftermath of Infinite Crisis, the world's three greatest heroes - Superman, Batman and Wonder Woman - all disappeared. By choice. They took a year off to recover from what they'd just been through, leaving the world in the hands of other heroes, both old and new. Heroes like the enigmatic Supernova. This mysterious masked man is the newest hero of Metropolis, and everyone from Booster Gold to Lex Luthor can't wait to find out who's behind the mask. So with the big three out of the picture, Booster Gold was trying to play himself up as a great replacement hero - unfortunately, the info he got from his robot pal Skeets was "buggy," at best, and he kept getting shown up by the new masked man. A big portion of 52 involved several characters' attempts to figure out who was behind the mask, though each allowed their investigations to be colored by who they wanted it to be. Which once again reminds us that the act of observing an event changes the event's outcome. In science, that's known as the observer effect; in comics, it could probably be called the Monarch effect. See? Dangerous. But knowing who's under that blue mask isn't necessary to recognize that the guy is a hero, or for this to be a good toy - in fact, the two are entirely unrelated. Is the figure any good? Let's find out! On the sculpt, Ray Villafane did a pretty good job. Snov (yeah, I just made that nickname up - great, isn't it?) isn't exactly a character with a complex, three-dimensional costume design, so all that was really required was a decent heroic physique, a fully masked face, and a cape that looked like draping cloth. Done! Unexpectedly, the edges of the colored panels of his costume are sculpted in - on the body and legs, at least. The arms are just painted. What's up with that? Our usual complaints about DC Direct's articulation hold up here, as well. Supes moves at the head (which is just a peg, not a balljoint, sadly), balljointed shoulders, hinged elbows, peg hips, hinged knees and, surprisingly, swivels at the boot tops. It's not that these boot joints don't suit the figure - they're great. It's just that DCD often tends to overlook places like this, where a joint would be perfect. He has no kind of wrists, thanks to the angular design of his gloves, but once again, we have to point out the raging stupidity of a character who can fly not getting a balljointed neck. Ugh! Supernova's costume is based, very loosely, on a costume Superman wore in 1968. In World's Finest Comics #178, Superman lost his powers, and started fighting crime like Batman. 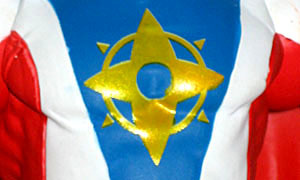 He designed a new costume - with a star on the chest and the forehead - and called himself Nova. Like we said, the connection is very loose, but it is there. For a more recent appearance, see Infinite Crisis #5, when Superman has a splitting headache (so to speak - you'll see what we mean). The costume design, by the way, is really nice. Whoever updated it did a great job. It's mainly white, with red stripes running down the sides and blue on the chest, shoulders and head. 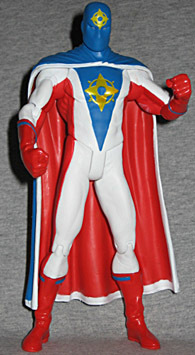 He also has a red and blue reversable cape. What's really cool is the way the design changes depending on how you see it. Head-on, it looks white. Viewed from below, it's red. Viewed from above, it's blue. This is a character with a lot of visual appeal. The edges of the paint apps can get a little uneven, but nothing terrible. It would have been nice if they'd used a darker yellow for his star ingsignias (which are the same as the logo of Metropolis tv station WGBS) - the blue is trying to show through. And just like Batwoman, his eyes are silver. Everyone had guesses about who Supernova really was. Wonder Girl thought he was Superboy, come back to life. 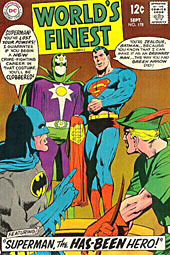 Lex Luthor thought he was Superman, wearing a new suit to screw with him. Booster Gold just thought he was a jerk. 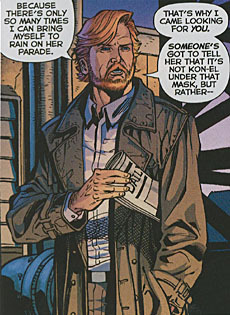 Ralph Dibny, the recently widowed (widowered?) Elongated Man, figured out who was in the suit - he is the world's second-greatest detective, after all - but didn't tell any of us. Jerk. His clue? That it clicked once he realized Superman was out of the picture. But since we've seen Supernova and Clark Kent at the same time, that's not it. Really, the problem was the powers. Novy could fly, was strong, had enhanced vision and seemed to be able to move at super speed - all traditional Kryptonian traits, under a yellow sun. But he also seemed to have some kind of light-based abilities, which might have hinted at him being the Ray, a second-generation hero who went missing after Infinite Crisis. But then there's the teleportation thing, too - something none of the likely suspects can do. Plus, at least once he was shown changing size like the Atom, who went walkabout after Identity Crisis. Mystery! Going by the press the various aspects of DC's year-long 52 event garnered, Supernova was a washout. New Chinese superteam The Great 10 shared full-page coverage in The New York Times with the new Batwoman, whose outing drew much attention from bigots and idiots alike. But Supernova? Barely a peep. Shame, too, since his story was one of the more interesting in the book - beat the hell out of wandering in space, that's for sure. Our boy Supernova doesn't get any accessories but, then, he shouln't - he didn't use anything in 52. He's got the 52 logo base, though, which really could have been better. The base captures the look of the angled logo (a pseudo-Ω that made some speculators think Darkseid was going to be the big reveal of the series), but copying the font is only part of it - they failed to capture the purpose of the logo. On the comics, the covers featured a white banner across the top, with the numbers "52" cut out to reveal part of the cover image beneath. The base, however, is a translucent piece with dark blue numbers painted on. As one reader pointed out, if DC Direct wanted to duplicate that feeling, the edges of the base should have been solid white, with the numbers left clear. Sort of like the New Frontier bases. Not only would that have matched the comics perfecly, it would have looked really neat, too - totally graphically interesting. Luthor thought he was Superman, Cassie thought he was Superboy, Clark Kent thought he was... well, trustworthy, but that's all he had to say about the matter. So who was Supernova, at the end of things? Not telling. Pick up 52 to find out. Or, be like Ralph Dibny, and look for clues. It's all there. Odds are, you've already read the answer and just didn't realize it. So just go back to the start and put it all together - no joke. Dan DiDio, the executive editor at DC, annoyed a lot of fans (and some of his creators) when he gave away the secret of 52 in one of his weekly "DC Nation" columns. But really, the fans had no one to blame but themselves. It wasn't a spoiler that he just blurted out, it was something they had to work at. You didn't want to know what the ending was going to be? Don't try to decode the secret message, stupid! Yeesh. And Dan even told people not to spread it around if they figured it out. Of course, this is the internet, where nobody can keep a secret for more than five minutes. Someone cracked the code, then told everyone they knew. Yeah, DiDio put the code out there to be found, and he should have known it would be broken immediately. But still, why blame him when the real fault lies with the idiots who blabbed? The first rule of fight club is you don't talk about fight club - does no one appreciate a good secret any more?